< The bar is the focal point of Rotolo’s Craft & Crust. By creating a bar-like atmosphere, the chain has seen an improvement in alcohol sales and guest frequency. In the mid 1990s Mitchell Rotolo Sr. founded Rotolo’s Pizzeria, with the first restaurant located near the campus of Louisiana State University in Baton Rouge, La. “I started out as a young guy with a college bar selling pizza and beer,” says Rotolo Sr. “We had a lot of craft beer back then — 32 on draft in the 90s. I thought we were hip and cool and fun,” he says. During the next 20 years that fun college bar with an ahead-of-its-time beer list evolved into a 30-plus unit pizza chain with locations in Alabama, Florida, Louisiana and Texas. During that time, though, the concept naturally aged a bit. The interior got a bit stale, says Rotolo Sr., the tap count fell, and the restaurant, as evidenced by its alcohol sales per square foot, wasn’t the hip place that it once was. Instead of risking a slow decline, the management team decided to redesign. The goal was to once again become a fun, cool place to hang out, says Rotolo Sr. The return to the concept’s roots started with a front-of-the-house overhaul. To enhance the atmosphere, Rotolo’s Craft & Crust’s leadership decided to make the space more comfortable, and more beer focused. Producing these results started with the restaurant’s floorplan, particularly the bar. While still family-friendly, the bar at Rotolo’s Craft & Crust sits in the front of the restaurant, making it the first thing guests see when they enter. This move provides a more energetic ambience that encourages guests to hang out and have one more drink after finishing their meals, Rotolo Sr. says. Supporting its goal of going back to its 90s roots, the chain also enhanced its beer package. Locations now offer 40 beers on tap — mostly craft brews from around the country — featured in a custom tap tower. Staff store kegs directly behind the bar in a refrigerated cage. While the restaurant relies on direct draw from the kegs, it also uses a glycol system that keeps beer in the lines cold and helps ensure a quality pour. The company also invested significantly in the appearance of the bar itself. In the prototype Rotolo’s Craft & Crust location, the bar top was made from a 500-year old sunken cypress stump pulled out of a Louisiana swamp, while the bar face was made of bark from the same tree. The quasi-patio space inside the restaurant represents another big layout change in the new Rotolo’s Craft & Crust. Like the bar, this space encourages guests to linger. Sitting at the restaurant’s storefront, but to the side of the entrance, this area has large bifold windows that open when weather allows. Sets of bifold doors separate the patio space from the rest of the dining room. When open, they give the entire restaurant a more natural ambience; when closed, it allows the patio to serve as a private event space. The rest of the design mixes warm materials with slightly industrial elements. Rotolo’s Craft & Crust uses hardwood throughout the restaurant, including booths, chairs and tables, and exposed ceiling beams. Industrial elements prevent the design from sliding toward too-cozy-to-be-hip territory. Elements include brick walls with hand-painted murals and storage cages in the dining room where canned goods and retail items like T-shirts are held. like a brick mural wall and a cage in the dining room that’s used for storage. 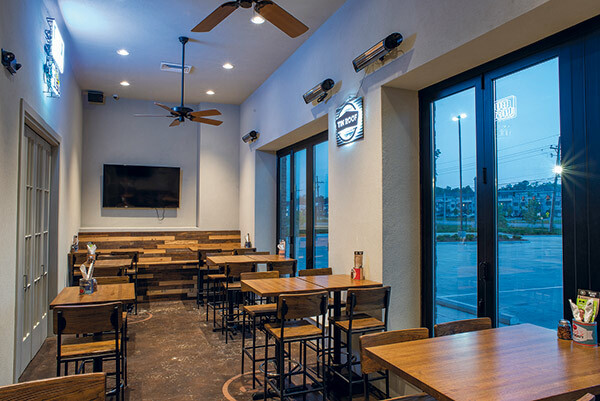 There was one change to the dining area at Rotolo’s Craft & Crust that wasn’t about the restaurant’s appearance and ambience as much as a reaction to the restaurant’s new menu. While Rotolo’s Pizzeria offers pies ranging from 8 to 18 inches, Rotolo’s Craft & Crust standard pies are only sold in one size, 13 inches. 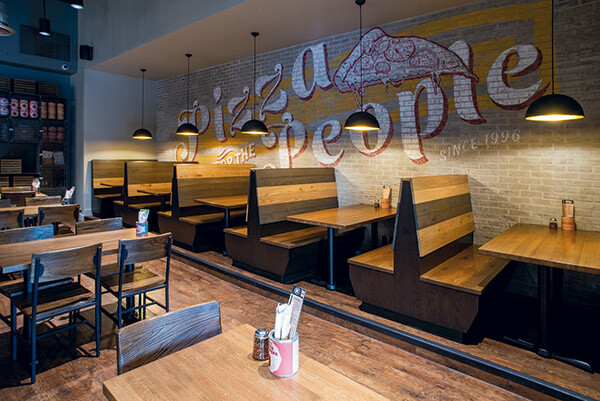 As a lighter option — say for children or during the lunch hour — the chain created a “slice bar” in the dining room, where guests can get pizza one piece at a time. The change to a one-sized pie offering is part of a larger remake of the menu — the craft in the Craft & Crust. Mitchell Rotolo Jr. spearheaded this effort, the company’s vice president of research and development. Having grown up in the pizza business, Rotolo Jr. has spent much of the past several years attending culinary school, winning medals in pizza competitions and basically becoming an expert in all things pizza. Once the update decision was made, Rotolo Jr. spearheaded the menu changes. This effort included a pizza tour he took with his father around the United States and Europe. “We’re bringing what we like from all those places. We’re taking the things that work with our concept, our people and what our customers really want,” says Rotolo Jr. The end result is a menu that includes the 13-inch pizza, a Chicago-style deep dish, and new, higher-end pizza toppings, including cold toppings like arugula and whipped ricotta. The menu also includes new appetizers, such as a fried cauliflower and ricotta dip as well as entrees like a fried shrimp alfredo. Supporting this new menu is, of course, a redesigned back of the house. The work of the kitchen starts in the prep area, which includes a 60-quart floor mixer for making pizza dough multiple times a week. The space also plays home to multiple tables, where staff chop produce (mostly by hand) on a daily basis. The restaurant has plenty of dry storage to hold bags of flour and a walk-in cooler measuring about 125 square feet. Rotolo’s Craft & Crust doesn’t have a storage freezer — or any freezer — due to the simple fact that it serves no frozen food, nor does it use any frozen ingredients. Staff add sauce and toppings at the pizza make table. After mixing the standard dough, staffers combine it with fermented dough, batch the mixture and then proof it for one to two days. After a break and then a second proof, the dough balls transfer over to the kitchen. Before it becomes a pizza, though, the dough sits for about an hour at room temperature, which produces a better bake and crisper crust, according to Rotolo Jr. When it’s time to make a pie, a team member takes a dough ball from a sheet pan sitting on a rolling rack and hand stretches it into a circle. To drive home the craft nature of its food, the company chose this method over options like a press that offer a more uniform shape, Rotolo Jr. says. 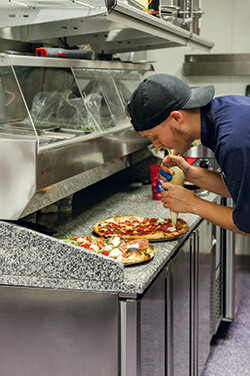 Once stretched, the dough gets its sauce and toppings from wells on a pizza make table on the restaurant’s cold line. 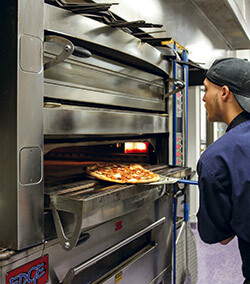 It then goes to the new double-stacked stone deck oven on the hot line, a 180-degree turn away. Despite the quality of this oven, it didn’t replace the chain’s older oven, a conveyor unit that actually serves as the base of the new deck oven. The chain kept this piece in order to cook a handful of items that simply work better in that unit. In a deck oven, says Rotolo Jr., the chain’s popular calzones tend to burn on the outside before the cheese on the inside melts. Rotolo’s also continues to bake its chicken wings in the deck oven, which produces a juicier and more consistent wing than frying, he adds. 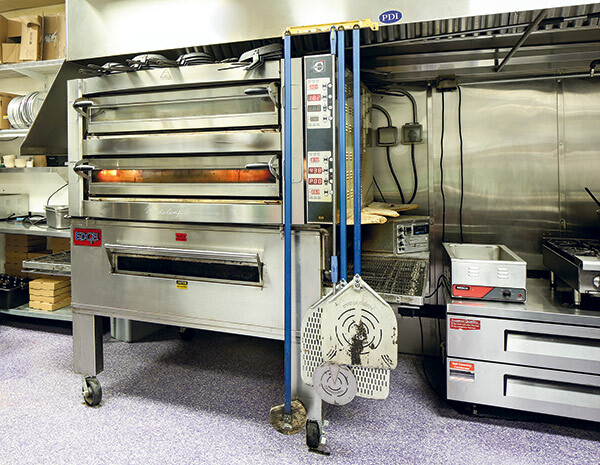 A double-stacked stone deck oven cooks all the pizzas at Rotolo’s Craft & Crust stores. Ironically, though, Rotolo’s Craft & Crust now includes a lone fryer on its hot line. Staff use this equipment to make fried cauliflower and calamari appetizers, as well as fried shrimp for the alfredo entree. A range serves as the other main piece on the hot line. This piece, a holdover from the previous kitchen equipment lineup, primarily makes pasta dishes. It sits on a refrigerated chef’s base, holding items that staff cook in the fryers. Items that come from the fryer, ovens or range then go to the kitchen’s 11-foot expo station for final garnishes, sauces, etc. 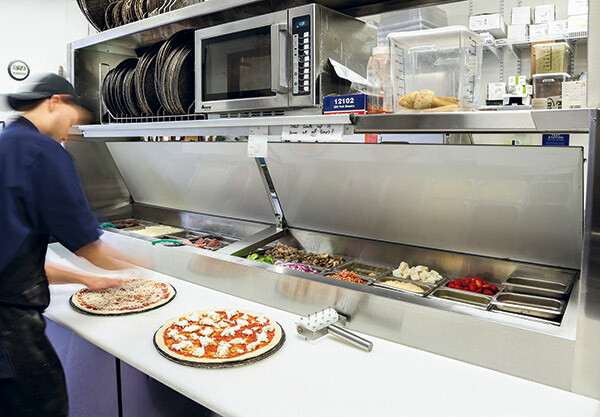 This becomes one of the busiest stations in the kitchen, and often requires three to four staffers, says Rotolo Jr.
Before making their way to the expo station, however, some pies and entrees visit the finishing station on the cold line, which sits opposite the hot line. At the finishing station staffers add the cold toppings, remove deep dish pizzas from their pans for cutting, and add other specialty toppings and garnishes to entrees. The rest of the cold line consists of a large salad table for side and entree salads. Notably, a break in the cold line’s equipment makes room for the staffer working the ovens. Since the launch of the Craft & Crust concept, Rotolo’s has opened a few more restaurants under that brand. By the end of October there should be five of these locations, including a few units converted from the Rotolo’s Pizzeria concept. More conversions should take place over the next several years, Rotolo Sr. added. “We’re not running two separate brands by any stretch. We’re going to update our existing locations while growing our footprint with new stores,” Rotolo Sr. says. These conversions will likely take many forms, he adds. Both Rotolo’s Pizzeria and Rotolo’s Craft & Crust are end-cap concepts. Where it makes sense, older Pizzeria restaurants may take on additional space to make room for Craft & Crust’s larger footprint. For these stores, the restaurant already has a plan in place to implement the Rotolo’s Craft & Crust design. Since 500-year-old sunken cypress stumps are hard to come by, the bar, along with other wooden elements, will feature reclaimed wood construction purchased from local providers. For the hand-painted murals, the restaurant plans to send the original muralist to each location to recreate her work. Other existing stores, though, may not be good candidates for a rebranding. In those situations, Rotolo’s may relocate a restaurant to find suitable real estate or a neighborhood that’s a better fit for the Craft & Crust concept. The company, of course, plans to open new stores. The chain will stick to its existing footprint of the Southeast, with target markets including large suburbs and college towns like Oxford, Miss., and Tuscaloosa, Ala., Rotolo Sr. says. Much of this future growth will come through franchising, and Rotolo’s is seeking owner/operators looking to open two to four stores. While restaurant industry experience is a plus, first and foremost, franchisees should be a cultural fit, with a commitment to implementing Craft & Crust’s high-touch processes. The brand, says Rotolo Sr., needs to be consistent. It can’t change location to location. Kitchen Design: Mitchell Rotolo Sr., Mitchell Rotolo Jr.
Chain Headquarters: Baton Rouge, La. Number of Units: 32 total, including three Rotolo’s Craft & Crust locations. Other locations will convert to the Craft & Crust concept in coming years.